…appropriate for just about every dimension of management, and particularly managing others, it is the change formula. And, while I found this concept mentioned directly in several change management references (particularly in the mid-1990′s), I have never seen it attributed to any source nor individual until I recently Googled the term. Thanks to Wikipedia we are now able to research the attribution for the Formula for Change. The change formula creates a framework with a built-in analogy to an inequality. The analogy simply requires enough content be applied in each variable of the formula (the framework) to overcome the audience’s, group’s or individual’s natural resistance to change (think of Newton’s first law of motion). Said another way, if any of the key elements of the change formula goes to zero, the inequality will flip and you will not be able to overcome the audience’s, group’s or individual’s natural resistance to change. Need for Change represents dissatisfaction with the present conditions; a compelling gap between “as-is” and the “to-be”. Vision of the Future represents a positive picture of what is possible in the future. I recently discovered a management consultancy advocating for the vision to be a compelling and emotional story, similar to current thinking in brand marketing. Whenever… you think of change, communication, negotiation, etc. For example, I recommended and have seen successful execution of this framework as the outline for communicating strategic direction in a number of organizations, including a domestic insurance company, an African manufacturer and my neighbor’s small business. 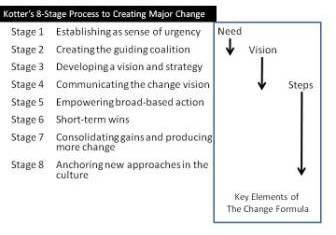 Further, the change formula can be a framework to define, communicate and understand key drivers of change management. Even if you do not like the framework, it can be a point of departure in a discussion to create a better way to think of change. Just to demonstrate the universal applicability of the change formula, to the right, I have mapped The Change Formula against John P. Kotter‘s Eight Stage Process of Creating Major Change (Figure 2) from his best selling book Leading Change (Boston: Harvard Business School Publishing, 1996), P 21. From Industry to Enterprise to Individual change the change formula can effectively help you think about the levers required to overcome the natural resistance to change.